belongs to the beryl family (Be3Al2(SiO3)6); can range in colors from pale yellow to a brilliant gold. Unlike emerald, golden beryl has very few flaws. 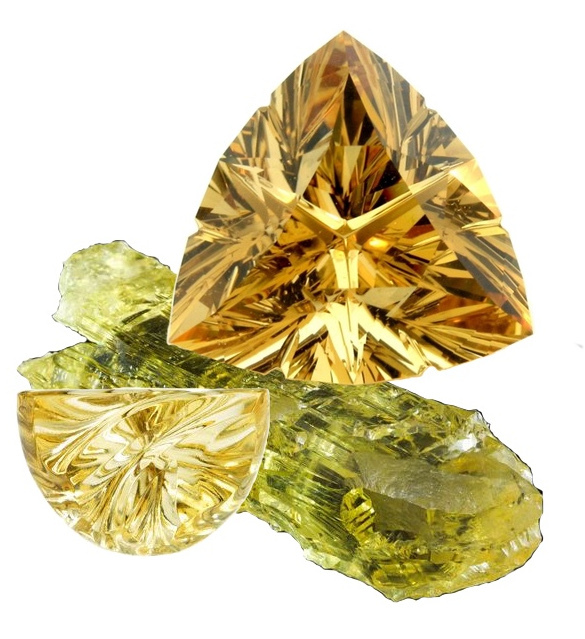 The term “golden beryl” is sometimes synonymous with heliodor (from Greek hēlios – ἥλιος “sun” + dōron – δῶρον “gift”) but golden beryl refers to pure yellow or golden yellow shades, while heliodor refers to the greenish-yellow shades. The golden yellow color is attributed to Fe3+ ions. Both golden beryl and heliodor are used as gems. Golden beryl, or heliodor, is a lesser-known gem, therefore it lacks the fame, myth, legend and astrology associations of better known gems. Despite the lack of major awareness, golden beryl does still have its place in the metaphysical world of crystal power. Golden beryl is known as ‘The stone of the sun’ and the term ‘heliodor’ was taken from the Greek language. Greeks believed that golden beryl contained the actual warmth and energy of the sun. Heliodor has been worn and used as talismans for many centuries. Golden beryl is said to boost the drive and determination to succeed of its wearer, and it can also protect its wearer from psychological manipulation by others. It can deter spirits, ghosts and dark forces. Physically, golden beryl is thought to strengthen the immune system and is thought to be useful for treating disorders of the liver, spleen and pancreas. Golden beryl is best for stimulating both the crown and solar plexus chakras, but it can be used on all chakras. Heliodor is thought to honor the Greek Goddess of Spring, Persephone. Golden beryl also honors Tiamat, the Sumero-Babylonian Goddess of Chaos. Heliodor does not represent any official month as a birthstone, but it is known as the stone of the moon.